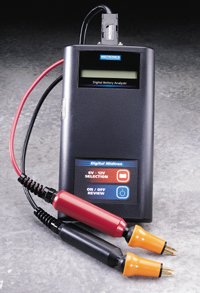 The Midtronics Digital Midtron Battery Conductance Tester is a highly accurate tool designed for the instant State-of-Health screening of 6-volt or 12-volt lead-acid batteries. Simple: One-step testing, no instrument inputs or adjustments required. Quick: Battery voltage and conductance displayed in less than 10 seconds. Test an entire 48V string in less than 1 minute! Safe: Utilizes patented conductance technology, a passive method that minimizes technician risk. Accurate: Field test proven to +/- 2% accuracy across test range. Conductance method recognized by IEEE standard for the testing of lead-acid batteries with proven correlation to battery capacity. Economical: Efficient and accurate battery tester priced to fit into every technician's tool kit. Tests 6V and 12V batteries both on-line (under float charge) or off-line. Consistent, repeatable on-line testing without battery discharge. Single test result retained in memory for further review. Prioritizes battery replacements and additional testing for cost-effective system management. No external power source needed. Test circuitry and measurement matches the Midtronics Micro Celltron. Kit includes soft carrying case and DuraProbe cable set. Midtronics, Inc., 7000 Monroe Street, Willowbrook, IL 60521. Tel: 630-323-2800; Fax: 630-323-7752.